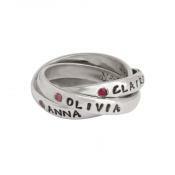 Double the fun with our personalized birthstone double name ring. 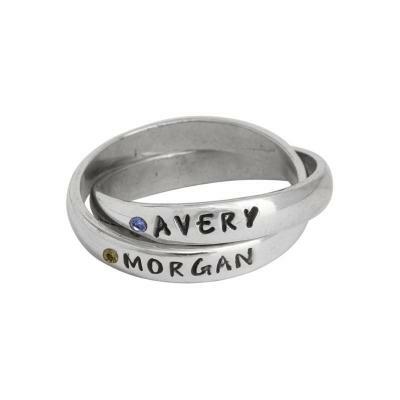 The mother of two will adore this ring with her kid's names and birthstones. The absolute perfect ring for the mother of two. 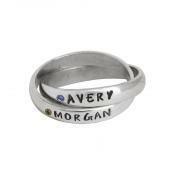 The personalized mother's Double Name Ring has always been N&L's most popular item but we have stepped it up a notch. You can now add birthstones! Each sterling silver band will have a birthstone followed by a stamped name or date. The overlapping custom stamped bands create a beautiful ring which is subtle and meaningful. This simple piece will become an heirloom you treasure forever. Personalize it the way you want, the way it is most special to you. Stamp the names of two kids or twins! If the names are short you can include middle names as well! Ring is made of sterling silver and band width is approx 3mm. We can stamp up to 12 characters per band. 2mm stones represent the colors of each month and are flush set by hand so each setting may vary slightly. All prices include stamping and the stone settings. We do not offer stamping on the inside of the bands. All sales are final. Because of the variety of natural and lab created stones and the small size of the stones, colors may vary from color pictured. Lighter color stones such as March, August and June may appear even lighter when set. PLEASE NOTE: Because of the labor involved, Rush orders take up to 5 business days to process before shipping. Sizing: Please tell us the size that is a snug but comfortable fit for the finger you will wear the ring. Since birthstone rings can not be resized we HIGHLY recommend you determine your size before ordering. You can either go to a jeweler or order a ring sizer from the drop down box. We recommend ordering up a size if you are ordering 3 or more single rings to stack on one finger.